From the dark pages of the internet, this is what Pollard and company wanted you to believe: (from GBVDB.com); This is a Bob SPONSORED release. 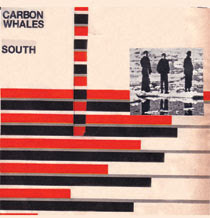 The Carbon Whales are an obscure band from the late 70s that actor Paddy Considine turned Bob on to. The 4 songs on this EP are apparently the only things they ever recorded. It was never released. Bob really loved it so we tracked the band down and asked if we could release it. The singer sounds EXACTLY like Bob. Check out the song writing team of Bob Evans and Joustin Clark. I Think It Should Be Our Band. This sort of game play was nothing new given the seemingly endless string of band names given for each track on the Suitcase box-sets. Such imaginary fan boy behavior regarding band names is also prevalent with the mystic surrounding Pollard's Nightwalker releases, and The Sunflower Logic's fake ordering catalog included with their EP. This release is a short blast of Pollard fronted post-punk said to have been laid to wax in 1979 (as the story goes). It was released on both CD and 7'' in 2008, and recorded shortly before that (in reality). Welcome to Miami- 3 Cold, cold cold. Carried by bass and sparse guitar. A mixture of early ‘80s post-punk alla Joy Division or a less rhythmic Gang of Four. Pollard’s bizarre take on copping a Johnny Rotten is the only off-putting part. Work Into Me- 3 Sounds like something Pere Ubu might have trotted out in the day with a dash of David Byrne-vocals, that melts back into a British post-punk drawl. How ‘bout that trumpet at the end? False Teeth- 1 Ominous bass rings out in the 1-2-3-rest pattern, with Pollard doing a Dio-esque voiceover. Also features appearances by bass drum kicks and guitar swells. Incredibly stupid. The Jeep- 4 An honest to goodness post-punk bassline with a great early ‘80s guitar line. Clean rhythmic shifts and deadpan, hummable vocals make this the most memorable and effective of this mysterious EP. I love this e.p. Sounds like great rock n roll to me.